WHY THE WORD SOCCER ? We have to thank the students of the 1880s for the word "soccer". It seems it was the practice amongst the well bred students of Oxford to abbreviate words whilst adding "er" to the end; "brekkers" for breakfast for example. Once asked if he wanted to play "rugger" (i.e. the "rugby rules") a student replied "no, soccer", an abbreviation of "association", or the "association rules", i.e. the rules of the Football Association in London. "Footer" was also used, but could have referred to either code. David Pickering's "Soccer Companion" (Cassell, 1994) names the student as Charles Wreford Brown, later an England international and F.A. vice-president. The origin of the penalty kick can be traced back to 1891 and a game in the fledgling English league between the two oldest clubs in Football: Stoke City and Notts County. The league was only two years old and County were winning the game 1- 0 when, in the dying minutes of the game defender Hendry handled the ball on the line to prevent Stoke equalizing. Despite the fact that the goalkeeper was hopelessly beaten and the handball was clearly intentional, all that was allowed by the rules as they stood was a free kick in front of goal. The County defenders (including Hendry) were allowed to mob the goal-line before the kick was taken and there was no way through. The sense of injustice provoked discussion about advantage among the clubs and a feeling that the situation should not be allowed to happen again. If the rules stood as they were, defenders would be free to handle the ball on the line whenever they chose. In fact it would be almost a century before players were sent off automatically for handling on the line. In the outrage that followed the game, the Irish Football Association proposed that a penalty kick should be allowed in such circumstances, and the rule was changed forever. But the rule change didn't work for Stoke. A few weeks later they played Aston Villa and were again losing 1- 0 late in the game, but found themselves beneficiaries of the brand new rule: a penalty was awarded with 2 minutes to go. Unfortunately, nothing prevented the Villa keeper from kicking the ball out of the ground and over the nearby fields before the kick could be taken. The ball was lost and time ran out before Stoke could take the penalty. Another rule change followed that match - penalties, once awarded by the referee, can be taken even after time has expired. The rule stands to this day. Naturally enough, Stoke had very little luck with penalties throughout the 20th century. Let's hope things even out a bit over the next 100 years or so. REFEREE ? WHO NEEDS A REFEREE !!!! The early players didn't need a referee! They were gentlemen, and any dispute could be settled by the two captains. Of course, this idyllic state of affairs couldn't last, especially when competitive soccer in the form of the Football Association's Cup came along in 1872. By this time, it had become the practice for each team to appoint an umpire. These two gentleman then ran about the pitch, keeping an eye on matters. They had no right to interfere with the game, but could be "appealed to" by the players, just as in the game of cricket today. They were given the power to award a free kick for handball in 1873, and for other offense in 1874. Also in 1874, umpires could send a player off for "persistent infringement of the rules". Of course, it is not surprising that occasionally the two umpires could not agree on a decision, and so the need arose for a neutral observer, the "referee". The first mention of the referee occurs in 1880. He was appointed by mutual agreement of the two clubs. He was required to "keep a record of the game" and act as timekeeper. He had the power to caution players who were guilty of ungentlemanly conduct, without consulting the umpires(though any such caution was made with the umpires present). If a player continued to transgress, or was guilty of violent conduct, the referee could send him off and report him, even if the player them proffered an apology. The referee was given greater powers in 1889/90, when was allowed to award a free kick for foul play without waiting for an appeal. It was only at this point that I suspect he needed a whistle! The well known story that the referee's whistle was first used at a Nottingham Forest v. Sheffield Norfolk game in 1878 seems not to stand up to scrutiny! Forest didn't play Norfolk in 1878, and the referee had no need for a whistle anyway! Not until the 1891/92 season was he finally given the power he has today, and allowed onto the field of play. The two umpires now assumed the role of linesmen, or "assistant referees" as we have to call them from 1996 onwards! 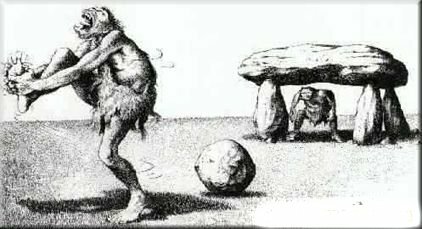 The first football was a pig's bladder, inflated with human lung power, and knotted at the end like a balloon. Boot and shoe makers then made a leather case for the ball, reflecting the shape of the bladder. This was "plum shaped"; rounder than today's rugby ball, but certainly not spherical. In 1862 came the invention of an india rubber bladder and a pump with which to inflate it. This allowed the production of a round ball, though some manufacturers still had a button at each end of the ball to hold the stitching together at the point where the leather panels met. "Buttonless balls" was a prime marketing buzzword for suppliers and manufacturers in the 1880s! The first time that a "standard" ball was specified was for a representative game between the (London) Football Association and Sheffield Association in March 1866, when it was stated that "Lillywhite's No. 5" must be used. Later, the Harrow Chequers club proposed that a fixed size of ball should be used for the FA's Challenge Cup Competition. The general agreement was that Lillywhite's number 5 should be used. After the tape measure was produced, the law became: a ball of average circumference of not less than 27 inches and not more than 28 inches. This rule was extended to encompass all games in 1883. A standard weight followed in 1889: from 12 to 15 ounces. This was amended in 1937 to become 14 to 16 ounces. It was the practice on mainland Europe, at least until the 1940s, to use a smaller sized ball, the number 4. The England team were somewhat bemused to be asked to play with a no. 4 in an international in Portugal in 1947. They finally persuaded the referee to use a no. 5, but after Tommy Lawton had opened the scoring for England, the players found a no. 4 had been substituted! England won 10-0, so it didn't help the Portuguese much! The finalists in the first World Cup Final in 1930, Uruguay and Argentina, could not agree on the size of ball to be used. Different sized balls were used in each half! Though the old leather balls could be treated with dubbin in order to keep them in good condition, they usually became waterlogged and heavy in wet weather. Modern balls have a waterproof coating. Anyone able to visit the Gilbert rugby museum in Rugby, England will find a fascinating display of early balls, soccer as well as rugby. The museum is just opposite Rugby School. I believe a craftsman is often to be found in the museum, demonstrating the art of stitching a football. The need for an "offside" law goes back to the early years of the game. A player was "off his side" if he was standing in front of the ball, that is, between the ball and the opponent's goal. To the Sheffield Association, this didn't matter at all! There was no offside rule, and players known as" kick-throughs" were positioned permanently near the opponents goal. 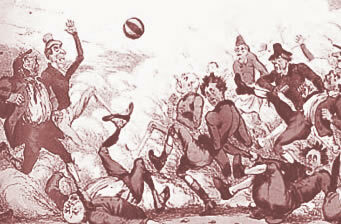 The people who drew up other "rules of the game" in the mid nineteenth century had been brought up with the idea of keeping all players "behind" the ball, disallowing the forward pass, and making progress towards the opposition's goal by means of dribbling with the ball or in a scrum. For a game of soccer to flow freely, it was essential to allow the forward pass, thus raising the need for an offside law. The Cambridge rules of 1848 stated that it needed three of the opponents side between a forward player and the goal for him to be "onside". However, the Uppingham rules of 1862 remained strictly against the forward pass; "if the ball is kicked by his own side past a player, he may not touch it, or advance, until one of the other side has first kicked it, or one of his own side, having followed it up, has been able, when in front of him, to kick it". The first set of Football Association rules agreed with the Uppingham idea. As football developed in the 1860s and 1870s, the offside law proved the biggest argument between the clubs. Sheffield got rid of the "kick throughs" by amending their laws so that one member of the defending side was required between a forward player and the opponents goal; the Football Association adopted the Cambridge idea of three! Finally, Sheffield came into line with the F.A., and "three players" were the rule until 1925.